Johannes Brahms never wrote an opera. Nor did Mahler, nor Bruckner. But in every regard the dramatic impulse was present in all, and in this marvelous new recording of Ein deutsches Requiem, Op 45, it dominates. When first conducting the German Requiem as a grad student at Stanford, I was perplexed by the issue confronting all who confront Brahms: is this the hand of the classicist, or the romantic? The startling ambidexterity of his signature allows wide reign. 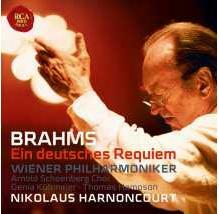 In this new Sony CD, led by Nikolaus Harnoncourt with soprano Genia Kühmeier and baritone Thomas Hampson, but propelled throughout by the Arnold Schoenberg Chor, we are drawn to Brahms the Romantic. Across the seven movements of the Requiem, the conductor finds and italicizes those dramatic apparitions that speak to the stage-worthiness of the work. This is not a dry oratorio dully reciting the words of the Requiem. In fact, Brahms chose a Protestant text that bears little connection to the Latin mass that informed most of his predecessors. More than by any other arena, this Requiem is informed by the passing and memory of Brahms’ own mother – a warm ghost that Harnoncourt never overlooks. It sweeps above and through every moment. The glory of this recording is its diction. The chorus, which carries 90% of the weight, is a wonder of articulate purpose. In accent and point and comprehension, this text is refreshed and reanimated. One cannot praise too highly diction in all voices, and – unsurprisingly – its constancy and accuracy of pitch. One reinforces the other. The orchestra is the Vienna Philharmonic, whose night job is that of pit band in the Vienna Staatsoper. No surprise, then, that those sequences of ‘operatic’ voice and dynamic do not elude this orchestra. Typical of this ensemble, every timbre has an intimate relationship with every other. Blend and balance are unforced, and wondrous. The work opens almost masked, with an abiding homogeneity and a string sound more closely matched to the human voice than perhaps any other orchestra in Europe. Rhythmic pairs are robust, and a contrapuntal energy pushes forward. The second movement is a kind of dead march, curiously in three, almost (like the slow funeral step of great British army units) holding in suspension on the third beat. It is an eerie and dramatic device. Thomas Hampson is in good voice in the third movement, and easy in his upper register. This is not the stentorian Hampson. He moves to pulse, and never lingers falsely. In this he is aided by Harnoncourt, surely one of the least libertine of conductors. The fourth movement is a small garden of easy energy, timbral openness, all grace and simplicity. Here the Vienna Philharmonic shines. In the fifth, soprano Genia Kühmeier provides a sweet and joyful colour, not pushing nor self-important. Her text, As one whom his mother comforts, so I will comfort you, is a model of compassion and repose. One occasionally hears a soprano attempt to make of this text a kind of star turn, serving self and not language. No such blunder of vanity occurs here. In the sixth movement, Brahms the dramatist assumes a new energy. Anglophones will recognize Brahms’ language, from First Corinthians and much earlier employed by Jennens and Händel: Behold, I show you a mystery… the trumpet shall sound, and the dead shall be raised incorruptible… Death is swallowed up in victory. Now, Hampson and the chorus are allowed full throttle, and take us to the words of Revelation in the seventh and final movement. Blessed are the dead… their works do follow them. And now this ensemble comes home to blessing, and deeper repose, and the certain confidence promised. One need not be a Believer to believe this: in the Brahms Requiem, and in this most thoughtful and joyful performance, we understand where Brahms the famous cynic concealed his secret self. The superb and comprehensive liner notes, with excellent sourced translations in German, French and English, are by Dr Benjamin-Gunnar Chors. Available at Sikora’s Classical Records, and in several formats online. Samples may be heard at amazon.com or sonymusic.ch.